Conservation-conversant locals know the Sierra Nevada area has a checkered past, thanks to historic land-ownership patterns. The same policies that allowed the railroads to expand westward-acquiring alternate square miles of land along the way-now make for complicated conservation and management. 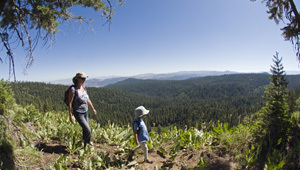 In spring 2010 The Trust for Public Land and the Northern Sierra Partnership marked a milestone in an expanisve project that knits together habitat and public access across 45 square miles of the High Sierra. Located in the headwaters of three major rivers—Middle Yuba, Little Truckee, and Feather—nearly 1,200 acres are now protected through the first-ever conservation easement acquired from timber company, Sierra Pacific Industries. Ultimately, more than 7,000 acres of checkerboard lands on either side of the crest of the northern Sierra Nevada will be protected.